Do you volunteer currently? Have you volunteered in the past?- We appreciate every single volunteer that comes to proVISION ASIA to lend a helping hand. Whatever your time constraints are, we will appreciate any time you can give to us and our cause. At our Centre and Mithra Special School, there are several reasons to volunteer with this disability NGO in Bengaluru. Mr. Anish Agarwal writes: “The reality in many developing nations including India is that impoverished youth sometimes becomes ignored and abandoned by their community because of low resources, but what is sometimes forgotten is their potential. Last summer break (2017), I made the choice to volunteer with this disability NGO in Bengaluru. I chose Mithra Special School at proVISION ASIA (A disability NGO in Bengaluru). This school has 24 underprivileged kids who are disabled and have minimal parental support as mentioned above. There, these kids are taught basic motor functions as well as general education so that they can become independent. They also provide individual physiotherapy and feed/transport the kids. Some of the things I did at the school: I interacted with the disabled kids, helped in their education of fine motor skills, created reports of children side by side with the physiotherapist, and wrote stories about some children so that the public can read what these children have gone through encouraging them to donate. However, something that stood out to me, which I spent most of my time working on is the “Prison Project” ( https://www.provisionasia.org/ourwork/ ). It is outstanding to see how volunteers, as well as prisoners, are changing the lives of the disabled children by refurbishing second-hand wheelchairs sent from the US to allow for better quality than a brand new Indian manufactured wheelchair. 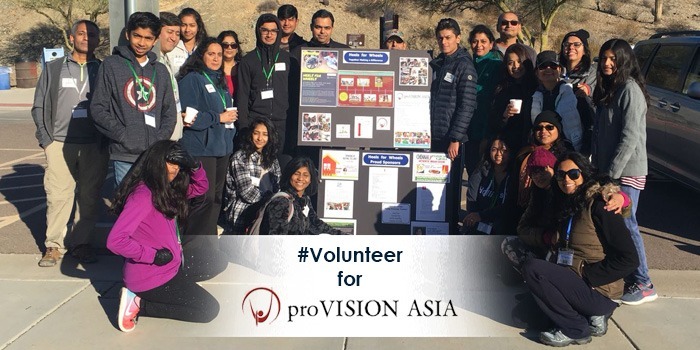 Overall, I enjoyed my time volunteering at proVISION ASIA, as I gained many new experiences from it, and I have embarked on a mission to support their ongoing projects here from the US by funding $5,000 USD for a consignment of 200 wheelchairs to be shipped to their center in Bengaluru. Two months ago (February 2018), I organized a hike by gaining partnerships with US-based, local NGOs to sponsor my event. All the email chains and back and forth contacting with Corporations was a lot of work, but it was all worth completing. I really learned how to unite my community through a small event that would make such a large impact as I put myself in a leadership role to personally get in touch with large Corporations to gain support for my event. In the end, it was very satisfying to see all my friends and family coming to support my event, along with many unfamiliar faces who had still come out to learn about this cause and make a difference. I also set up a fundraiser in my school to allocate more donations to contribute to my goal. There, I connected with many faculty and student body leaders to build this fundraiser platform and I became a notable figure with significance through this project rather than just one of a four thousand student school. With these two fundraising platforms, I was able to fulfill my $5,000 goal giving 200 disabled people in India a new sense of mobility. I didn’t just stop there: Additionally, I linked proVISION ASIA with another local NGO in the US called Project CURE, which is the largest medical equipment distributor in the world. I facilitated a meeting by inviting the Founder of proVISION ASIA, Dr. Charles Kingery Jr., to Arizona to meet with a locally based executive director of Project CURE. This built a global tie-up and it allowed Project CURE to physically donate used wheelchairs to this wheelchair project in Bengaluru. Mr. Danny Gray writes: “My first experience volunteering was when I was 17 years old. It was not my own decision, but even then, it still affected my life. In my youth I didn’t think about how what other peoples’ lives were like, I was too busy worrying about my own. It didn’t even dawn on me that others might have it worse than me. Stepping into someone else’s environment and seeing life through someone else’s eyes, will change your life. Your perspective will not only change but also your attitude towards life. That selfish 17-year-old boy finally realized that the majority of the world has it worse than he does and everything changed. Do you have the same reasons as these two volunteers? Email us today to find out more about volunteering with a disability NGO in Bengaluru: info@provisionasia.org.